Seniors are encouraged to come on out and enjoy great food and conversation with old and new friends on at three upcoming Christmas events. The menu for these Seniors Luncheon Social events features a traditional Christmas meal of homemade soup, turkey with cranberry sauce, potatoes, stuffing, vegetables, dessert, bread and butter, coffee and tea and will be catered by Bill Grieve, the chef with Wheel House and Occasions Catering. Join in the fun at Picton Town Hall on Wednesday, Dec. 5; Hillier Town Hall on Wednesday, Dec. 12; and South Marysburgh Town Hall in Milford on Wednesday, Dec. 19 19. All locations are at noon. The cost to attend is $10 per person for the meal and also some Christmas -themed activities you won’t want to miss. 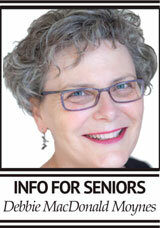 Seniors are asked to reserve by the Tuesday prior at noon by calling 613-476-7493. Take-out or delivery (to seniors in the immediate area) is available. Simply make the arrangements for this when you call in to reserve. Seniors will have a great time of Christmas craft making and refreshments at Sophiasburgh Town Hall in Demorestville on Tuesday, Dec. 4 or at Athol Town Hall on Thursday, Dec. 13. Both events are from 10-11:30 a.m. Chat with friends old and new while making seasonal decorations. Craft supplies will be provided. Call the County Seniors Centre today to register or for more information, 613-476-7493. Community Care’s Thrift Shop is holding a Terrific Trees Silent Auction. See the three exceptional, beautiful and unique themed trees on display at 153 Main Street in Picton. Bidding closes at 2 p.m. on Saturday, Dec. 8. All of the funds raised support programs for seniors in Prince Edward County. Community Care is offering a 12- hour Level 1 course in Picton (six hours on each of the two days) the first week of December. For more information check the Facebook page, call the office at 613-476-7493 or see the web site at www.communitycareforseniors.org.